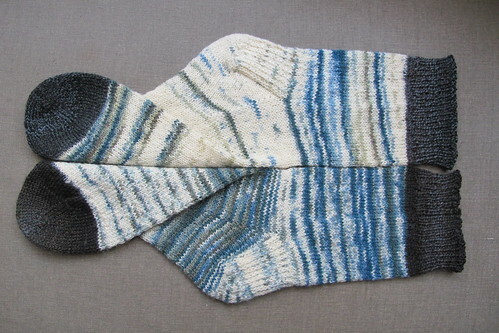 I’ve just remembered that these socks I made for my dear Papa have been received. So by my rules I can now publish them. Wendy Johnson toe up slip stitch heel pattern. Two different kinds of Schoppel Wolle yarn. The pale one is in fact leftovers from two people’s knitting. My own and also my generous donor. We happily share both colour preferences and a fondness for Schoppel Wolle. 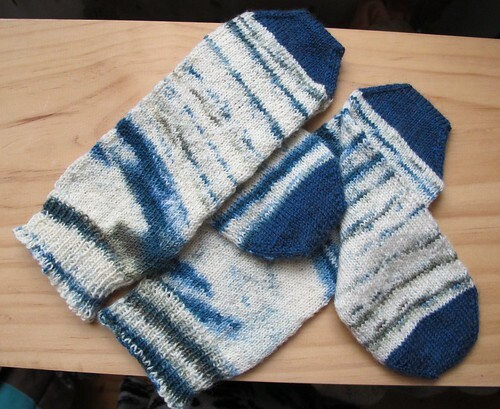 Just so you have more socks to look at, below is the previous pair I knitted from this yarn (pair #19). These are again Wendy Johnson toe up socks, but with an afterthought heel. Toe and heel are a merino possum blend. A friend asked for the pattern for my shopping bags. The directions might be a bit cryptic without pictures. Next time I make some, I’ll try to remember to take pics during construction and update this. 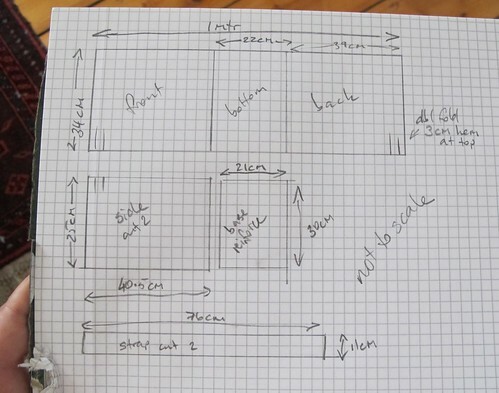 Note that I haven’t drawn this to scale, use the written measurements. 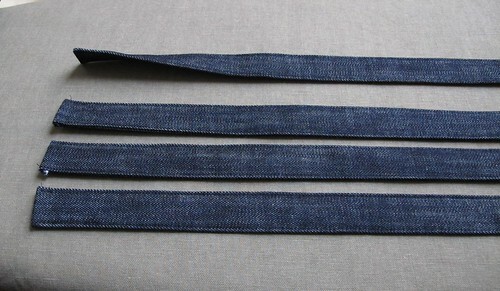 As pictured, the measurements work for the soft cornered plain seam version. -Overlock around the base reinforcing piece and sew onto the wrong side of the bottom. Or cut it out big enough to press under a seam allowance before sewing on (this is bulkier of course). -Sew the sides to the base with a 1.5cm seam, then overlock. -Hem the top (double fold 3cm hem). -Press the straps, long sides almost to the middle. Fold back on themselves and sew the ends shut. Clip corners, grade and turn open. Press neatly the whole length in half lengthwise ready to sew. Edge stitch both sides in the same direction. -Place the straps on the front and back. I do them 12cm apart and 11cm from the top edge. Edge stitch the overlapped section with a few additional runs to secure the top edge. For the stiff cornered reverse french seam version, add 1.5cm to the bottom depth (24.5cm instead of 22cm) to match to the side measurements. There is not a lot of point making this version unless your fabric has some stiffness to it. -Overlock around the base reinforcing piece and sew onto the wrong side of the bottom. Or cut it out big enough to press under a seam allowance before sewing on (this is bulkier of course and can conflict with the outer seam in this version). -Sew the sides to the base inside out with a 0.5cm seam. -Hem the top (double fold 3cm hem). If your fabric is heavy, it’s important to reduce bulk at the vertical seams as much as possible. -Right sides out, Sew again around the side and base seams with a 0.7cm allowance. Sew each section separately, don’t try to sew around the corners. Where those lovely straight straps went. Not exciting but useful. 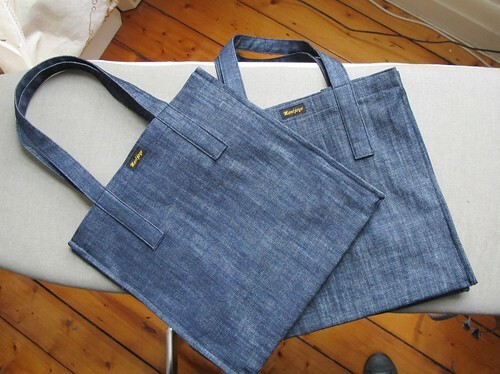 Grocery shopping bags made from denim left over from one of my almost jeans projects. I’d not have needed to make them, but I foolishly dropped one of my set in a carpark. I didn’t realise until I’d got where I was going. When I went back, it was not to be found. 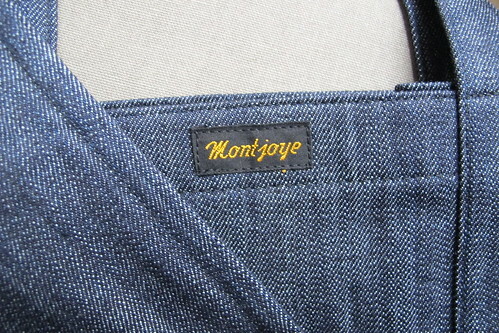 So there is a Montjoye bag out there randomly somewhere. I hope it gets used. In denim, these should last me many years, as long as I manage to not leave them behind in random places. 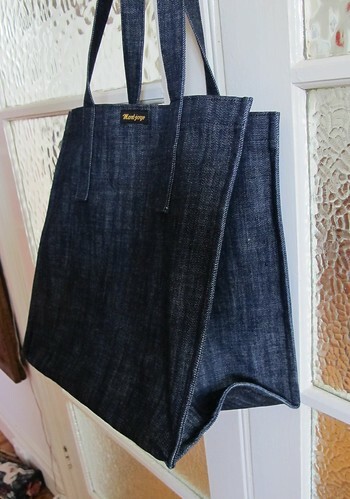 These are to the same pattern as my last Shopping Bag Mk II. I’m sewing straps for some more shopping bags. 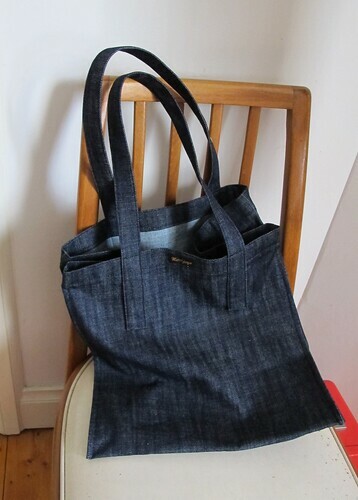 I did the first one on autopilot, using a blind hemming foot to guide the stitching as usual. This works well if one only wants to sew to the left of an edge. That encourages sewing the two edges of a piece in opposite directions though, which causes a twist in the finished piece. Then I remembered that the edge stitch foot I’d ordered months ago, had arrived since last I had cause to do any edge stitching. Wonderful! Now I can edge stitch to either side of an edge!! Hurrah! So I sewed the other three straps with the new foot. Both sides sewn the same way up in the same direction. These straps lie flat! 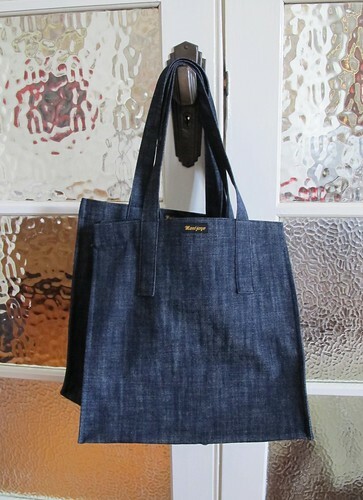 Yes one can sew in any direction by hand guiding under a standard straight stitch or universal foot. Using a foot that guides by the folded edge produces a much more even result with far less effort. Blind hem foot on the left, edge stitch foot on the right. Both have a central blade to govern the relationship between the edge and the stitching. 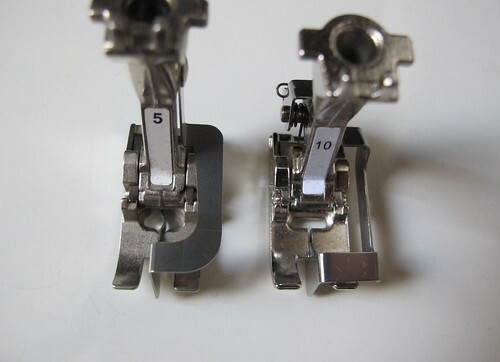 The wonderful thing about the edge stitch foot is the freedom of needle postitioning. 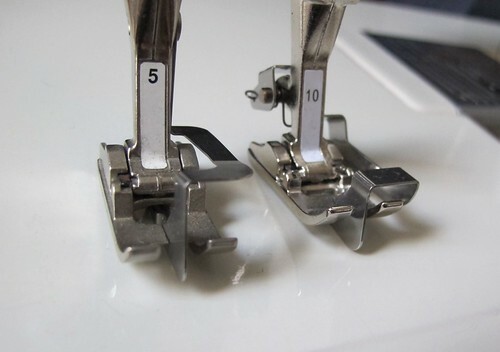 Bernina feet. Other machines may have different feet available. Quick notes for my reference. I had something under a kilo of good berries that I wanted to get out of the freezer. I didn’t feel like making straight raspberry jam and jelly is easy, though messy to make. It turned out with good colour and flavour. Would have been even better if I hadn’t lost quite a bit of the raspberry liquid in a boil over. Bother. Put each to a different saucepan, almost cover with water, bring to boil, simmer until soft. Strain both through a jelly bag. This gave 1.5L liquid. Boil down for 30min to 1L. Turn off heat. Add ~900g sugar, stir and wait until dissolved. Bring back to boil for ~20min or until set is achieved. Bottle.